March has been complicated for InSight. The HP3 scientific instrument encountered difficulties early in its operations. The drill of the scientific instrument stumbled upon something, perhaps rock or a harder layer of regolith. This triggered the interruption of drilling to understand what is happening. NASA has devised a test in which the hammer HP3 will be started while SEIS, the seismometer of InSight, will record the vibrations. This may help to uncover clues about the nature of the problem. But there is a good chance that the HP3 drill will still be immobilized for a few weeks. For the experiment to be successful, it must be able to dig up to at least three meters deep, ideally up to 5 meters. A first problem just 30 centimeters from the surface of the planet Mars shows that drilling will be complicated. The seismometer of the InSight mission recorded its first signals from the planet Mars. These signals are not due to Marsquakes or meteor impacts. Martian winds produce microseism in SEIS data, such as low frequency tremor. This first detection shows that the seismometer works as well as expected. Over the two years of InSight’s primary mission, the mission team expects to detect about one Marsquake per month. They should occur in groups, and they should be distant of several weeks or months. It will therefore be necessary to wait before InSight gives its first results. The heat flow sensor installed on the InSight lander on Mars is designed to collect valuable information on the thermal conductivity of the Martian crust. It must first drill five meters deep. To dig, the instrument uses a kind of jackhammer that hits the ground a hundred times an hour. The process is very slow, especially as the terrain seems more difficult than expected. The first hours of drilling allowed the instrument to dive a few tens of centimeters into the ground. It has already met two stones. The indenter is designed to be able to spread them to the side while bowing slightly, but this process requires a lot of time and slows the maneuver. Let’s hope that the depths of the planet Mars will have fewer stones. It would be very annoying to encounter a large stone at shallow depths because they can not be pushed so easily to the side. Drilling should continue for at least the entire month of March. The SEIS seismometer, deployed by InSight at the end of 2018, was covered with a protective bell at the beginning of February to isolate it from wind and temperature changes. 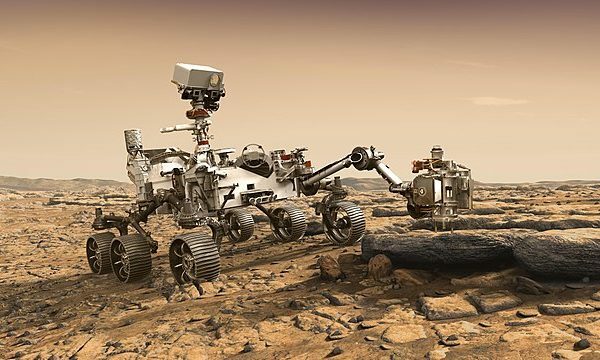 The position of the cable between the lander and the seismometer was slightly adjusted because the seismometer vibrated a bit because of the Martian wind. The seismometer aims to record the seismic waves spread in the crust of the planet Mars. InSight’s robotic arm has just installed a jackhammer right next to itself. The heat flow sensor needs to dig five meters deep to set up its thermal sensors. It will take 30 to 40 days for the instrument to make its hole. Let’s hope there are no big boulders on the drill’s path as it is designed to dig only in relatively soft terrain. If it can not go down to 5 meters deep, the experience data will be much more difficult to analyze. However, there is almost no rock on the surface of the place where InSight landed, which is a good sign for the composition of the subsoil. Thanks to the seismometer and the heat flow sensor, we will understand a little better the internal structure of the planet Mars. On Mars, the InSight lander continues its deployment. For now, the priority is to test the instruments and systems of the lander. The photos of the environment where InSight is located show that NASA seems to have well chosen the landing site, which seems extremely flat. This will facilitate the installation of the ground seismometer of the planet Mars, named SEIS. The placement of instruments is a critical decision for the mission. It could be several months before a site is designated. But even on InSight, the seismometer SEIS already records small vibrations caused by the Martian wind blowing on the solar panels of the lander. This corresponds to a barely audible sound. This is the first time we are able to hear the Martian wind. But we must not forget that this same wind and the dust that it carries will be a real danger for the mission in the long run. InSight landed on the planet Mars ! The landing of InSight on the planet Mars went smoothly. As usual, the atmospheric reentry and landing phases have been moments of high tension, but this is starting to be the routine for NASA. Indeed, the US space agency has succeed all its martian landings the last two decades. The landing took place in the area of ​​Elysium Planitia, a region close to the Martian equator that has the distinction of being very flat. NASA generally prefers to put its robots near ancient rivers, where geological and biochemical discoveries are most likely. But InSight is not directly interested in life on Mars, it is the interior of the planet that preoccupies this new lander. The chosen area has made it easy to land, its proximity to the Martian equator will provide maximum brightness for InSight’s solar panels, and the ground should be flexible enough to allow deep drilling. One of the two main tools of InSight will require to dig up to 5 meters below the surface of the planet Mars. A heat flux sensor will help to understand how heat flows from the planet’s core to its crust. This should help us better estimate the internal composition of the red planet. This scientific instrument was designed by the german space center (DLR). The other main instrument of InSight is a seismometer designed under the supervision of CNES. The tectonic activity of Mars has never been measured directly. We will therefore be able to discover the frequency of Mars quakes and the frequency of meteorite impacts. The study of seismic waves should provide valuable clues to the internal composition of the planet Mars. While waiting to be able to start its scientific mission, InSight must carry out a medical assessment and to start. For the moment, everything seems to work well. NASA said that the solar panels of the robot are properly exposed to light. InSight has also sent its first pictures. As expected, the landscape around InSight is very flat. The CubeSats MarCO A and B were launched in the wake of InSight with the mission to monitor its landing. These CubeSats transferred the signal that announced that InSight landed. This is the first time that CubeSats are used in an interplanetary mission. They survived for months under the harsh conditions of the interplanetary void. Since they do not have the ability to orbit the planet Mars, they will continue their path in a heliocentric orbit. This first success may push NASA and other space agencies to consider CubeSats as interesting tools for exploring the solar system. Their very light weight and high standardization makes it possible to launch this type of mission at a ridiculous cost. It will take a few months to launch the scientific experiments of InSight and to carry out the drilling necessary for the installation of the heat flux sensor. The data collection will last at least two years. The first results should be released in 2019 or 2020. The InSight lander is approaching the red planet. If all goes well, it will land at the equator on November 26. InSight will have to observe the Martian depths using its seismometer and its heat flow sensor. The InSight lander is followed by the first two interplanetary CubeSats. These CubeSats will fly over Mars following the descent of InSight. The two tiny explorers, each the size of a shoebox, have transmitted their first images of the red planet. 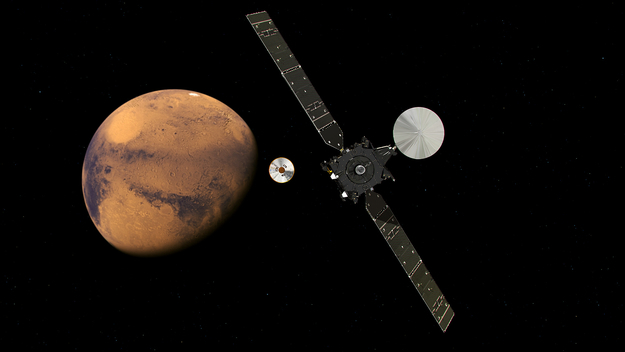 The Insight lander is currently travelling to the planet Mars where it will land at the end of November to carry out measurements of heat propagation and seismic activity of the red planet. The Insight lander tests its instruments before arriving at its destination. Testing a seismometer in space is not useless because the instrument was able to detect and measure the launches of the micro-thrusters of the space probe. It even may have identified a micro-meteorite impact. This seismometer seems in perfect condition to help us understand what is happening in the depths of Mars. 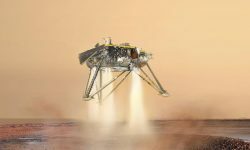 The InSight lander is currently undergoing a series of tests before being launched next year to Mars. InSight is a robot designed by NASA to study the depths of the Martian subsoil using seismology and geodesy. It is not a rover but a stationary robot that will stay at its landing site. By studying the depths of Mars, we can learn more about the Earth. Indeed, Mars is a relatively inactive planet for three billion years. Its rocky mantle has therefore changed very little since that time. But we think that the structure of the Earth and the structure of Mars are very similar. The activity of the Earth’s mantle makes it difficult to study its past. By focusing on Mars, we can look at a photo of the Earth’s mantle three billion years ago. The InSight lander should be positioned near the Martian equator. InSight will be powered by two circular solar panels. The robot will deploy its two scientific instruments using a robotic arm. The first scientific instrument is a precision seismometer that will record any trace of seismic activity in the landing zone of the robot. This seismometer was designed by CNES. Its second scientific instrument will be a heat flow sensor. It must sink five meters below the surface of the ground, which will be the greatest depth dug by mankind on Mars. The heat flux sensor will be used to determine the thermal activity of the core and to understand the geothermal history of the planet Mars. The mission is initially planned to last two years, but InSight could continue well beyond that date. The mission also includes two CubeSats that will serve as a communication relay during the descent phase of the InSight robot. Unable to fit into Martian orbit by their own means, they will then pursue a trajectory that will place them in an orbit around the sun. Mars is today a planet whose core is almost inactive. With the InSight lander, NASA hopes to study the low residual activity of the planet Mars. This should also make it possible to determine in part the composition of the Martian mantle. The seismometer should be sensitive enough to capture the impacts of meteorites on the planet Mars. By studying their frequency, it will be possible to better understand the risks associated with a possible inhabited mission. In May of next year the lander InSight will be launched. It is currently the only mission scheduled for the planet Mars for 2018, before the invasion of orbiters, landers and rovers that will leave for Mars in 2020.